I have a new “hobby”, and I must admit, I am completely addicted. Perhaps “obsessed” might be the proper term. Luckily for me, it is a great use of Creative Cloud, so I can get away with it! What is this new obsession, you ask? Aerial Photography. However, I’m not flying airplanes or riding in helicopters. In fact, my feet aren’t even leaving the ground at all… just my camera. It all started a few weeks ago when my friend Tony approached me about getting some aerial photos for experimentation. He knew I already had a GoPro camera, and that I was completely obsessed with it… GoPros take incredible pictures, and are very durable. The only thing was that we needed a reliable way to get it off the ground. Enter part 2 of the equation, and the greatest part of my obsession: the quadcopter. Basically, it is a multi-rotor remote controlled helicopter. Multi-rotor copters are mechanically very simple, very stable, and versatile. Just check out this TED video to see how agile and versatile they can be. I had been wanting one of these for a long time. Researching here and there, looking at the DIY and pre-built kits. I wanted something that would be easy to fly, but also capable of outdoor flight and a camera payload. Copters can range from inexpensive children’s toys to high-end hex/octo-rotor professional rigs for many thousands of dollars, and I looked at nearly every one of them. I finally settled on the DJI Phantom. It has a GPS guidance system that makes it easy to fly, corrects for wind drift, and even has a “return to home” feature if the battery gets low or if it loses contact with the controller. Yet, it can be very maneuverable and agile. It is easy to setup, and comes with a GoPro mounting system. A word of warning, once you start down this path, it is very easy to become obsessed – I will elaborate more on this subject in a bit. For now, check out some of my recent photos with this rig. You can see the full collection (and any future photos) on my Flickr photostream. Accept the fact that you will crash. Even though the Phantom is very easy to fly, at some point you will, without a doubt, crash the copter. Luckily every piece of the copter can be replaced. If your battery is almost dead and you try to take off, the copter will just flip over onto the ground. If you are trying to land and there is a strong gust of wind, you will likely crash. If you descend too quickly, you will crash. I mention each of these, because I have done all of them. Immediately replace the nuts that hold the propellers onto the copter. Within the first week of owning the Phantom, I lost a propeller and the copter came plummeting to the ground. Luckily, I was only about ten feet off of the ground when this happened. The “dome” nuts that ship with the copter look pretty, but are not reliable. Get some new nuts with lock washers, Nylock nuts, and/or some thread lock to prevent the nuts from loosening due to vibration. If you use thread lock, just be sure NOT to get any on the plastic propellers. I have heard it will do bad things to them. If you are like me, you will immediately want to explore all of the ways that you can use the Phantom once you get it. This will lead you down the road of watching countless YouTube videos that others have created, reading DIY instructions for modifications, and scouring the web for upgrade options. Extra batteries. The Phantom comes with one battery that lasts 10-12 minutes. You will want more batteries for additional flight time. Travel Case. Without a doubt, you will want to protect your copter. I have mine in a cardboard box lined with bubble-wrap to prevent damage from travel and toddlers. If you plan on travelling with your copter (which I do), you will want something like one of these. Upgraded Propellers. Larger propellers provide additional lift. Balanced propellers provide less vibration. Stiffer propellers also provide additional lift. The Phantom ships with 8″ plastic props. I’m looking into 9″ wooden or carbon fiber, balanced propellers. Camera Gimbal System. A gimbal system will keep your camera stable, regardless of the pitch or yaw of the copter. This will make a huge difference if you are producing video. There are lots of options, from DIY kits, to the official DJI/Zenmuse Gimbal system that was just released today. I am drooling over these options. Vibration Isolation Mount. If you have a gimbal, you probably already have this, but if you don’t, you might want one. A vibration isolation mount will reduce the copter vibrations that are transferred to the camera. This will result in better quality images and videos, and less “jello effect”. ND/Polarized filters for the GoPro camera. ND filters and polarized filters can help improve the captured image or video, and can minimize the “jello effect” due to vibrations. FPV Video Navigation System. An FPV (First Person View) video system gives you the ability to see exactly what the copter sees when you are flying. This can be really useful for framing of photos, or flying beyond line-of-sight. Most of these will require you to modify your copter. You can use the GoPro app as a limited FPV system; although keep in mind that it operates over an ad hoc wifi connection. If you lose the connection, you lose the video feed. … and there are many, many more. So, I’ve written all about the copter so far, but what about Creative Cloud? How does it tie into quadcopters? 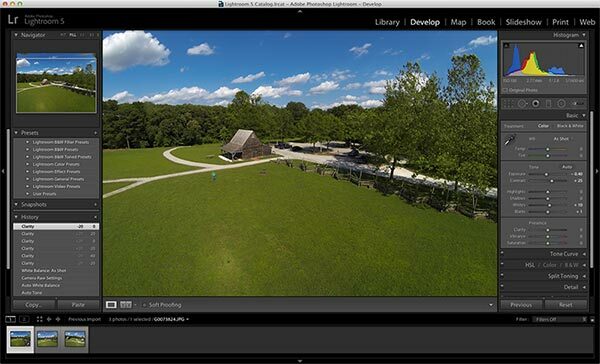 Creative Cloud enables you to do more with the aerial imagery that you capture from the quadcopter. When taking still images, I setup the camera so that it will automatically take two pictures every second. When you’re flying for 10 minutes, this ends up being a lot of images. 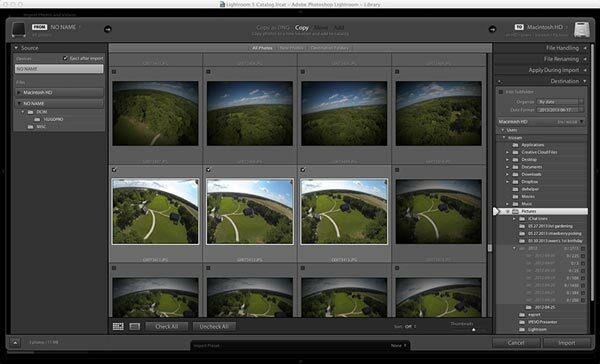 Lightroom enables you to quickly import, tag, develop, and publish your images. Many of the images need additional editing before they are suitable for your final product. 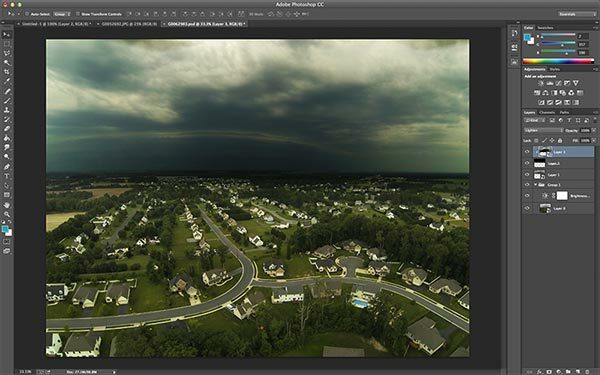 Whether you need to remove objects (such as landing gear, shadows, people, etc…), or you want to tweak clouds or make other dramatic changes, Photoshop enables you to do these things. Photoshop enables rich editing and retouching of images. Of course, it’s not all about still images. 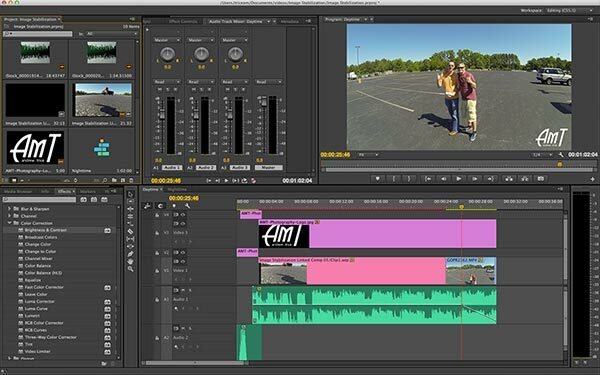 Premiere and After Effects enable editing and production of your captured videos. You can use Premiere to arrange multiple clips into a broader sequence, and you can add post-processing effects and image stabilization with After Effects. …and what is a video without audio? Audition provides you with a rich environment for audio production. Whether it is editing the captured audio, or producing new music and soundtracks, Audition has you covered. Here’s another video that I produced using Premiere for edits, stabilization with After Effects, and Audition for audio tweaks. Granted, I do not have a gimbal or other stabilization system, so bear with the quality! This is just the proverbial “tip of the iceberg”. Creative Cloud gives you the tools you need to create amazing multimedia content, and the means to make that content engaging and interactive – from hobbyist to die-hard professional. Once you’re happy with what you’ve got, don’t forget you can share it on Behance via your Creative Cloud membership! The latest version of Premiere Pro CC is seriously awesome. There are tons of new features and performance improvements… everything from cloud synchronization of settings across computers, to the new Mercury playback engine, to asset browsing, editing improvements, closed captioning, and more. However, I think my absolute favorite feature in Premiere Pro CC is the ability to synchronize multiple video clips based on their audio tracks. 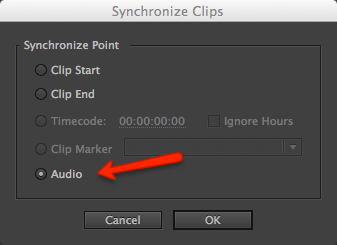 You can simply select the clips that you want to have synchronized, right-click, select “Synchronize”, then select the “Audio” option. This feature will temporally align the video clips by analyzing their audio tracks. 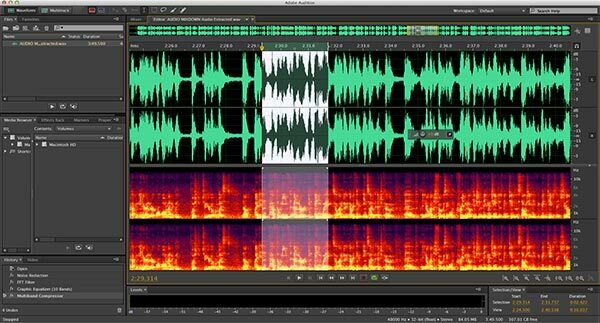 You no longer have to compare waveforms manually to try and align everything to the precise frame. For me, this has been a tremendous time saver. Check it out, in action, in the video below! This is one of the many features and product updates that were launched in Adobe Creative Cloud today. If you aren’t a member, you’re missing out on all of the latest and greatest features. Head on over to creative.adobe.com to become a Creative Cloud member and get started today! 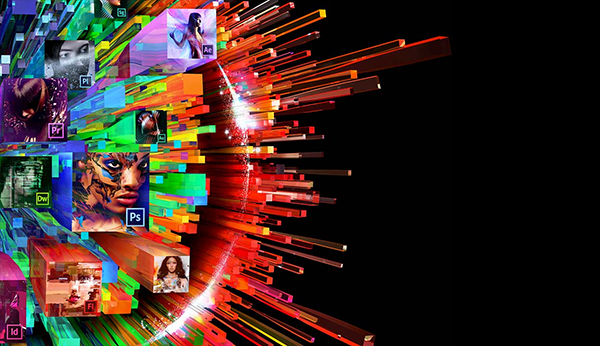 The latest release of Adobe Creative Cloud tools are now available! This includes updates for over 15 tools, including Photoshop CC, Illustrator CC, Premiere Pro CC, InDesign CC, Dreamweaver CC, Edge Animate CC, Edge Code CC, Edge Inspect CC, After Effects CC, and more! This release is Adobe’s best yet, and not only includes our best tools, but also greater integration with Adobe’s Cloud services. You can learn more about everything in today’s release from the Adobe Creative Cloud Team blog, or go directly to creative.adobe.com to get all of these applications today! Recently I’ve undertaken some explorations with fellow evangelist Kevin Hoyt, trying to determine how far we can push PhoneGap applications with devices and physical computing. Turns out, you can push things really far and now I’m delighted to share one of the experiments that we’ve been pursuing. In this exploration, we researched whether or not you can use a pressure sensitive stylus with a PhoneGap application. Again, the answer is YES, you can. Check out the video below to see a sample application in-action. This example demonstrates the use of a TenOne Pogo Connect Stylus inside of a PhoneGap application. Note: This is not connected to Project Mighty in any way – Kevin and I started exploring completely separately from the big announcements at MAX. In those functions, you check if any of the touches are pens, and if so, do something with that pen input. The first catch with implementing this inside of a PhoneGap application is that you can’t override the touch handlers of a web view on iOS. Luckily, there is another way! I leveraged a UIGestureRecognizer instance to intercept the touch input that is received by the web view, determine if the touches were from the PogoConnect Stylus, and if so, then delegate that input back to the JS layer. UIGestureRecognizer is normally used as a base class for creating custom gestures in iOS applications. If has everything you need to handle touch input, and it gives you that information without having to subclass an actual view. This means you can attach it to any UIView instance. Since you don’t have to subclass a view to use this, this plugin can be implemented in a PhoneGap native plugin without having to modify *any* code inside the PhoneGap framework. I created two sample applications to test this functionality. The first is a very basic app that simply outputs the pressure as text which follows the pen tip. The intent with this app was really just to prove the concept and determine if it was actually possible to receive and respond to information from the stylus. Once I proved it could be done, the next logical step was to create an app that actually takes advantage of the pressure sensitivity information. So, I made a sketching app. I started off by expanding on the drawing logic from my Lil’ Doodle PhoneGap application. This uses a requestAnimationFrame interval to render content in an HTML Canvas element using a “brush image” technique. Next, I added logic to vary the opacity and stroke size based on the pressure information received from the pen plugin, and a few other options to change the pen tip/brush shape and color. 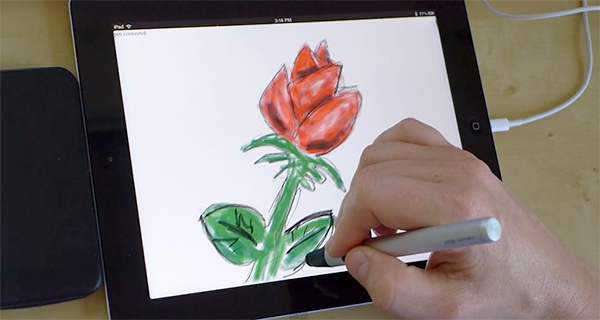 First, the obvious, you know the pressure being applied to the pen tip, and the app can respond accordingly. Next, you have an extra input method. The button on the pen allows you to interact with the device without having to actually touch the device. I used the button in two ways: first, if the button is pressed and held, the pen erases instead of draws. Second, if you double-tap the pen button, it brings up the drawing options. These options are where I placed controls to modify the pen color and stroke. Third, the plugin provides bidirectional communication with the Stylus. When you change the pen color, the LED on the pen will display the selected color for a few seconds. I used a modified version of DevGeeks’ Canvas2Image plugin to save the content of the HTML Canvas to the device’s photo library. I also had to leverage a variation of this technique for getting the data from the Canvas element without transparency. All button and slider styling leverages Topcoat, Adobe’s brand new open source CSS framework designed to help developers build HTML-based apps with an emphasis on performance. Note: This is iOS only – The third-party PogoConnect SDK is for iOS devices only. This example will also ONLY work if you have the PogoConnect Stylus. It does not support other stylus devices or finger-only drawing.